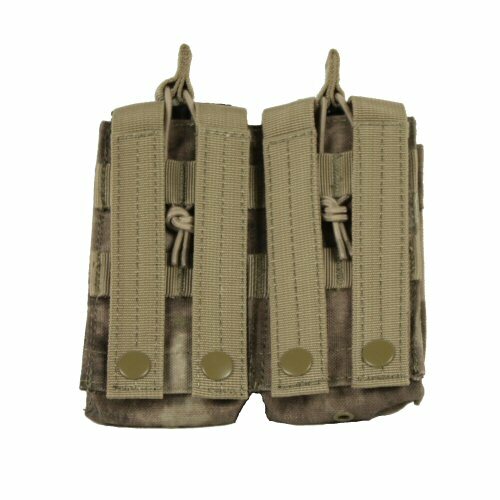 The Condor ATACS ACU double kangaroo mag pouch combines the silent and popular bungee-secured rifle magazine carrying with a pistol or small utility pocket in front. 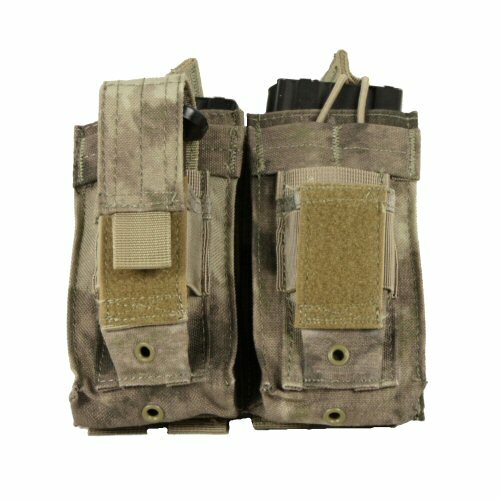 The mag pouch carries two M4 magazines side-by-side securely with a high-bodied pocket. An extra thick elastic shock cord is tied around the top, and 25mm loops of webbing hold the bungees in place. These also provide an easy to grip surface for retracting the bungees. The cord given come with enough length to allow for slightly taller, higher capacity magazines to be used with the pouch. 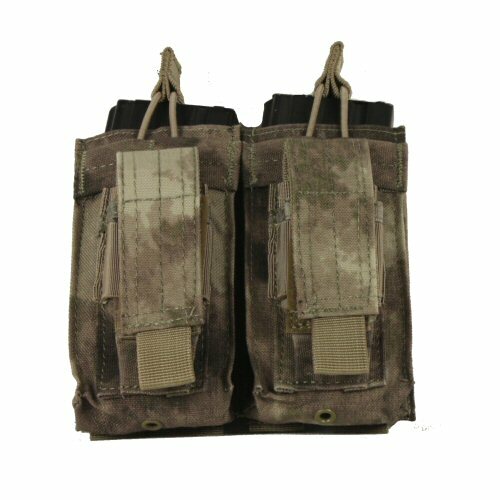 The front of the pouch is fitted with expandable magazine pockets for standard pistol magazines or utilities. 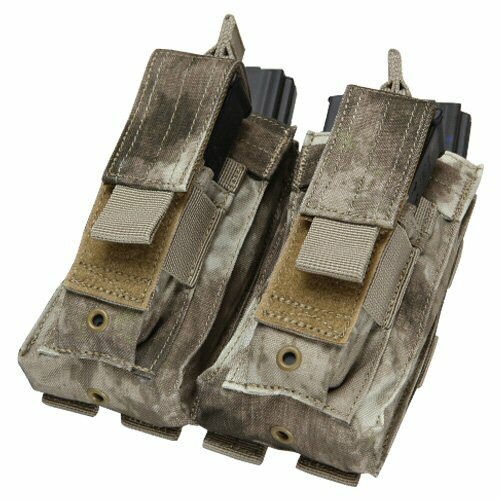 The lids of the pistol mag pockets can be removed or re-attached at a higher point to allow for different heights depending on magazine type. They can also be completely removed if the velcro hook and loop is too noisy. Each magazine pocket has an elastic retention strap around the body to secure the contents when the lids are not in use. Each pocket has its own drainage hole. 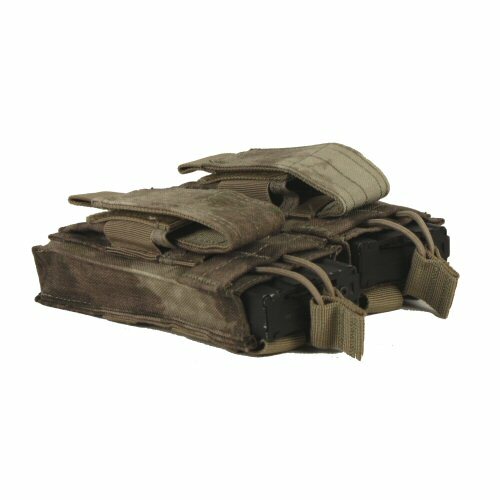 Four MOLLE straps on rear make this pouch very secure on the MOLLE base. Made of genuine ATACS AU milspec 1000D Cordura. A front view of the pouch. The pouch with one of the pistol magazine lids removed and a pistol magazine inside the left pistol mag pocket. The rear of the magazine pouch. A top-down angled view of the magazine pouch showing the magazines inside.